When locals in Baras, Catanduanes welcomed Australian surfer Peter Sutton to their isolated cove in 1984, they had no idea that his visit would help place Puraran Beach and Catanduanes on the tourist map. Sutton was lured by the perfect barrel waves brought off by swells from the Pacific breaking on Puraran’s offshore reef (later termed “the Majestics”). Puraran was eventually featured in the June 1988 issue of California-based Surfer Magazine and soon surfers started flocking to the golden-sand beach. All that sounds well and good if we’re into surfing but unfortunately we both are not. And even if we were the timing of our arrival was well outside the surfing season from July to October when the swells are at their highest. So what does Puraran Beach have to offer for non-surfers during the offseason? Plenty it turns out. 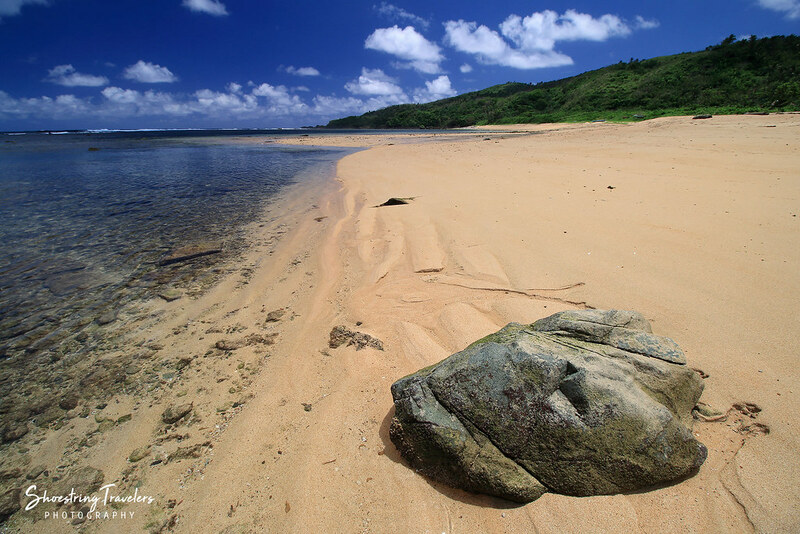 Despite all the attention, Puraran’s fine, golden sand beach has remained relatively pristine. The sandy area of the beach is wide and long. The clear waters are also shallow out to several score meters to sea and at low tide revealed several interesting varieties of marine life. Best of all the beach is quiet and uncrowded with only one other group sharing the wide beachfront with us (it never gets crowded even during surfing season according to other bloggers). From a distance once can observe the Pacific surf pounding the reef; beginners can still surf at Puraran around the time we visited. Advanced and professional surfers visit from August to October when the Majestics are at their peak. For us though, the most interesting feature of this beach are the rock formations on its western section. A pair of huge rock outcrops stood like sentinels offshore with a few more scattered near the western end of the beach and towards the sea. Closer to inland is a mass of angular rocks, their shapes cut, hewn and polished by the furious action of the Pacific surf. There are a few resorts on the beach and, despite Puraran’s international popularity, not one of them is of the high-end variety. Fortunately for us. We arrived at Puraran just in time for a late lunch. The food served at the Puraran Surf Beach Resort was not only reasonably priced, it was also delicious and filling. The resorts here have an interesting history. Since Catanduanes is often in the direct path of typhoons traversing the Luzon mainland from June to October, Puraran often gets its fair share of howlers. The resorts had been devastated by strong typhoons several times but the owners simply rebuild them and get back to business. 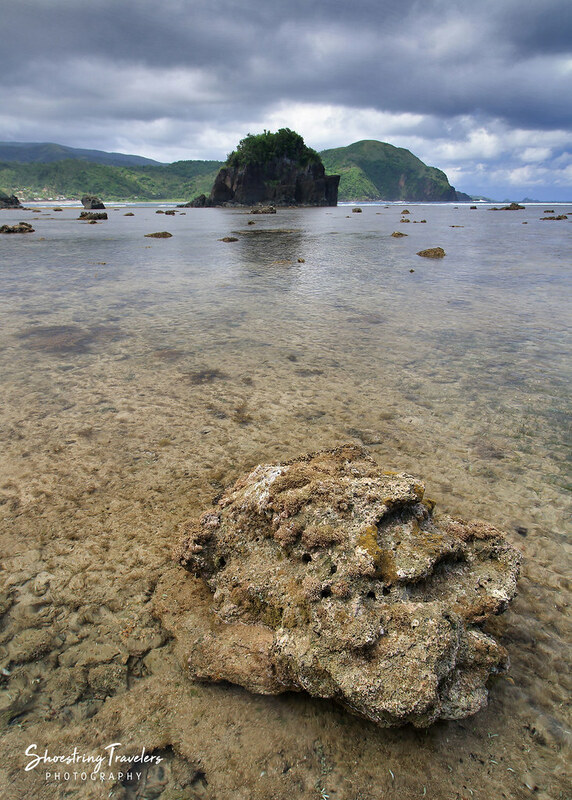 It makes us think that the people of Catanduanes are built of sterner stuff mainly because of the harsh natural conditions they have had to endure. Visit this blog for directions in going to Baras town from Virac. From Baras town proper, ride a trike to take you to Puraran Beach. The roads to Puraran from Baras town proper are good all the way. Normally visitors pair the trip to Puraran with a trip to Binurong Point like we did on this trip. We found out that it is better to just rent a trike that will take you all the way from Virac to Binurong Point and Puraran Beach since waiting for the jeepneys in Virac to fill up before leaving for Baras often takes a lot of waiting time (it’s a bit more expensive though). You can also include a trip to nearby Balacay Point as part of your package. Balacay Point offers a stunning panoramic view of Puraran Beach and its adjoining coastline. 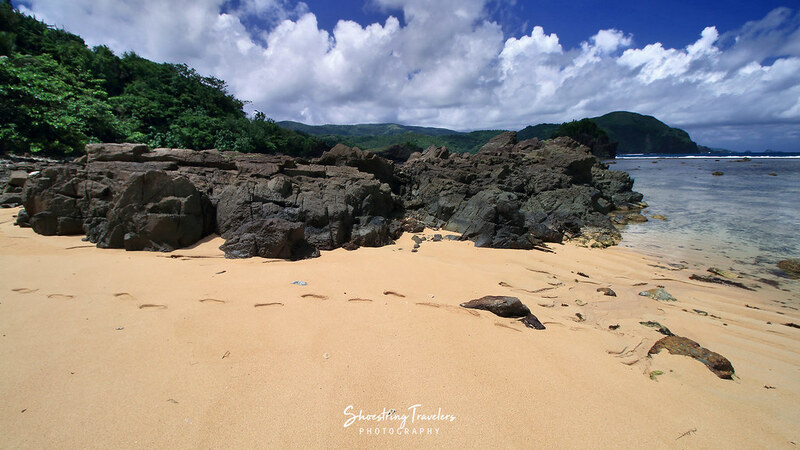 Posted in Catanduanes, Travel PhilippinesTagged Baras, beach, Bicol Region, Catanduanes, Puraran Beach, surfingBookmark the permalink.